Reception: February 17, 2:00 p.m. - 4:00 p.m. The Adelphi University Exhibitions Program presents ‘In the Radiance of Shadows’ featuring the work of alum Warren Lyons. 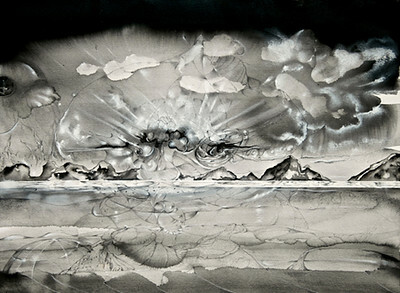 This exhibition, on view at the Ruth S. Harley University Center Gallery from January 21st through February 28th, 2013, showcases over a dozen ethereal landscape drawings and paintings . The opening reception will be held on Sunday, February 17th, from 2:00 to 4:00 p.m. The exhibition will feature the artist’s black and white transmographic mixed media works. His ambigious drawings and paintings contain deeper implications that emerge upon closer observation. Appearing in a constant state of becoming or disintegrating, his work evokes the viewer’s subconscious. With a background in pschology Warren Lyons incorporates the mysteries of his innermost thoughts into his work. Born in Brooklyn, Warren Lyons was influenced by the artistic practices of his father, a painter and sculptor. He graduated Adelphi University in 1973 where he began his study of the relationship between art and psychology and the use of poetics as a method of self exploration. To view glimpses of the exhibition please visit adelphi.edu/artmuseum/exhibitions/ and to receive updates “Like” us on our “Adelphi University Galleries” Facebook page! The development of these pictures involves a process of interfusing multiple layers of ideas, media, stylistic elements, colors, light and shadow. The images often depict scenes and fragments of memory, presented simultaneously and from varying points of spatial and temporal reference. The combination of these components renders a unified, multi-leveled pictorial field. For me, the visual, visceral and cognitive experience engendered through both the creation and viewing of this work, is that of an ever expanding sense of interiority, imbued with the ambiguity and paradox akin to dream states, reverie, or the process of remembering what has been forgotten. While these images share superficial aspects and physical features commonly associated with “landscape” painting, there are deeper implications and meanings which emerge, upon closer observation and reflection. Things can be seen existing beside, within, around and throughout what may, at first, appear to be singularly identifiable. Still other things appear in a constant state of becoming and/or disintegrating. These paintings are “maps” of the territory of the unconscious. While they explain nothing, they may evoke different impressions. The sensations deriving from such an encounter are often potent and meaningful, whether or not they are readily understood. In essence, these works are about the mystery and enchantment of seeing and being touched by the wonder of things, from the vantage point of irreducible being.